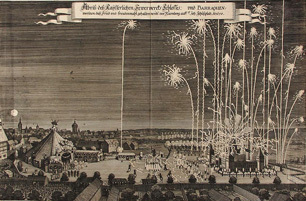 Among barium's many uses is to help fireworks to explode green. Barium is a lustrous metal used in the manufacture of a wide assortment of products, including electronics, plastics, rubbers, bleaches, dyes, fireworks, ceramic glazes, glass, enamels, bricks, paper, metal alloys, lubricants, pharmaceuticals and cosmetics. Barium is also commonly used in the oil and gas industry to soften mud for drilling, where it leaks into the ground and may contaminate groundwater. Other ways it can enter the environment include discharge from metal refineries and erosion of natural deposits. At high concentrations, barium can affect the central nervous system, causing paralysis and, with a high enough dosage, death. Some people who drink water containing barium in excess of the maximum contaminant level [2 milligrams per Liter (mg/L) or 2 parts per million (ppm)] over many years could experience an increase in their blood pressure. The EPA recommends ion exchange, reverse osmosis, lime softening or electrodialysis for the treatment of barium.